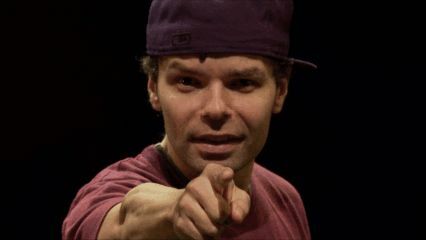 TrustMovies had never heard of Lemon Andersen, the light-skinned and even blond (when he was a child), baby-faced Hispanic rap poet who first made his artistic mark as part of Russell Simmons' Broadway show Def Poetry Jam back in 2003. Actually, Lemon first made his mark in prison (his mug shots are shown below), as a three-time felon who only later became a one-time Tony Award-winner. One way this quite interesting documentary might have been even more interesting is to have allowed us to find out a bit more about Lemon's various felonies. But clearly, this young man wants to concentrate (and wants us to concentrate) on his future rather than his past. maybe/could-happen-if production might eventually take place. 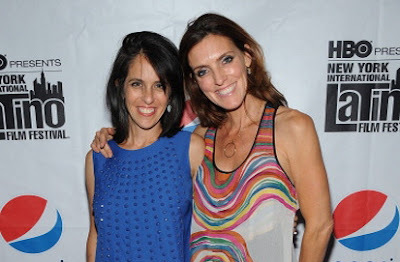 The filmmakers give us a very interesting insider's look at some of the ways that power in the New York legitimate theater scene is used, how theaters vie for control (what looks like complete control) of a property, as well as how they also try to make that property reach its pinacle artistically. Both the American Place and Public theaters encourage Lemon to delve more deeply into the very things he'd rather not address. 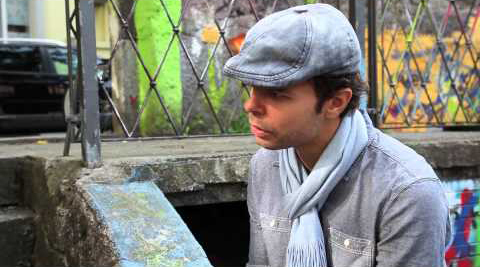 "I have to go back to a place I tried so hard to get away from," he tells us. So he and his wife, a rather remarkable woman named Marilyn, head off to Puerto Rico, where he comes from and was happy to leave behind him, to find his mom's grave and visit relatives. 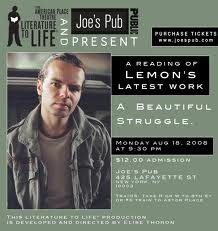 We're with Lemon as he makes his Joe's Pub debut, then later tries to raise the money needed to put on his show in the Public Theater (Spike Lee gets a lot of credit here); we're with him rehearsing and then performing on opening night -- his poem Watch Me! is absolutely electric; we're with Marilyn (shown below), too, as as she goes to school for, and then finds gainful employment as, a licensed masseuse; we're at their daughter's birthday party as Lemon is suddenly taken back to the old life as he confronts a birthday present for his daughter that still has its "shoplifting" alarm attached to it; and we meet Lemon's older, estranged brother and see the two siblings individually trying to come to terms with each other. Finally, by the conclusion of the nearly hour-and-one-half documentary, a real and full character has begun to form around this engaging, obsessed performer, even if, as I say, we're still reading between those lines. I must admit to loathing almost all rap music I have heard over the years, and yet I absolutely love the rap poetry of Lemon Anderson. You very well may feel that way, too, and you'll certainly find the poet who performs this to be someone pretty special. The 83-minute DVD of Lemon hits the street this Tuesday, October 16, in advance of the much shorter, 52-minute version that will be shown on the PBS culture series, Voces, this coming Friday, October 19. 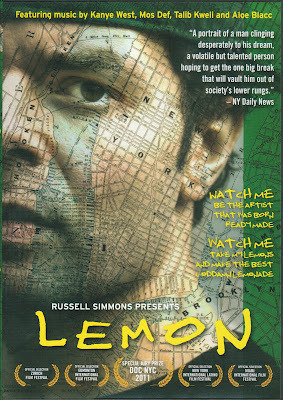 From Cinema Libre Studio, the DVD comes complete with special features that include additional performances by Mr. Andersen, deleted scenes, outtakes and a Lemon trailer.